At West Coast Maids, we know that a clean home isn’t just about how clean your house looks. It’s also about how clean your house feels. Having a messy, dirty house can have huge effects on a persons metal state leading to possible depression and low self esteem. Having a clean home can help you feel better about your environment and about yourself. It can increase self-esteem, a persons motivation and more importantly it can increase a person quality of life. Vancouver is notorious for allergies causing pollen and dust. With a clean house the daily sneeze attacks might become a thing of the past. By purging your home of all those dust mites, you can improve or avoid allergies and hay fever entirely. Frequently vacuuming, washing your sheets and curtains, cleaning out your sink and believe it or not that includes your refrigerator, and thoroughly dusting your furniture are among the best ways to control your allergies. Your annual spring clean is the perfect time to really reach those nooks and crannies that you rarely get to otherwise. Taking time now will save you headaches (and itchy, red eyes) later. Walking in the front door to be greeted by a whiff of fresh, clean-smelling air it makes everything seem so clean and inviting. Having a clean smelling home can really help increase your overall well being. Get rid of the mind clutter and negative thoughts filling your mind and start fresh with a positive outlook on life. Just make sure you use environmentally safe cleaning products so you don;t have obnoxious odours. Keeping your house clean and organized can reduce the chance of injury by minimizing clutter and keeping things out of harm’s way. Leaving loose items around like Lego and cars, will increase the risk of trips and falls. Simply tidying up and organizing can make a huge difference in the overall safety of your home. Keeping your home clean provides more opportunities to detect mold growth and fix the problem in a timely manner. Mold can wreck havoc on people’s health, causing allergic reactions, cold and flu-like symptoms, asthma attacks, and other severe health problems. Regular cleaning and inspections will help control and prevent mold growth. 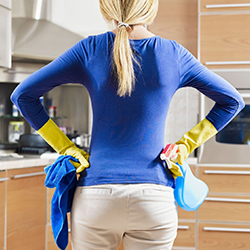 Cleaning could improve your physical fitness. Cleaning and vacuuming contributes to your health and fitness. Turn the music on let your inner dancing diva out.